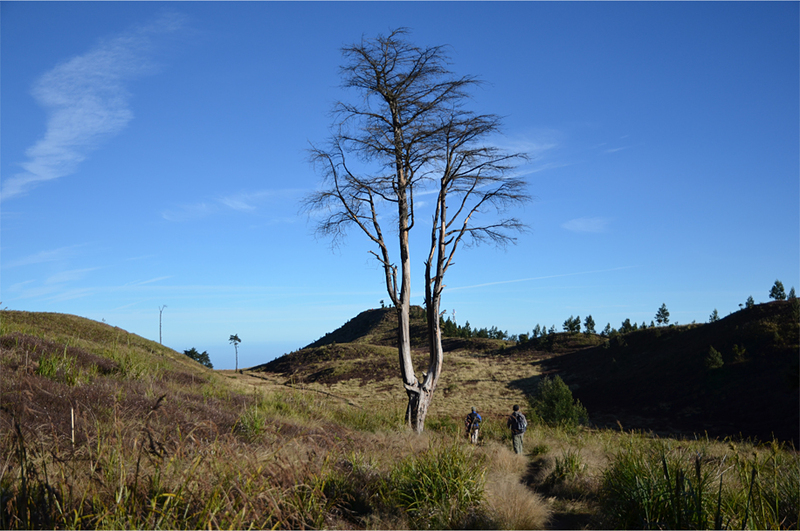 On a grassy ridge at the top of Gunung Prahu, the mountain shaped like a boat’s hull, I was getting exasperated. “Close enough,” I thought. We’d pulled ourselves out of bed at one in the morning, as the rest of the village slumbered peacefully under the brightness of the full moon. 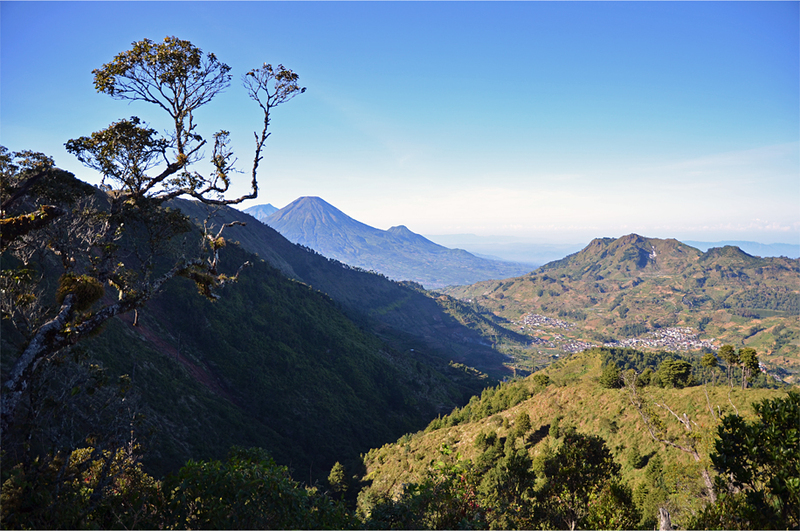 Captivated by the rugged scenery around Dieng, a fertile basin in Central Java’s volcanic highlands, our group had unanimously agreed to a sunrise hike some two days earlier. By this time, on the cusp of dawn, I had grown so tired and miserable I almost didn’t care. But Bart was not backing down. Burying my bare hands deep into my pockets, I begrudgingly started to walk eastwards along the trail. Gusts of frigid air whipped at our faces and sent the long grass into frenzied waves of motion. Five days into a three-month journey across Indonesia, I had never expected to feel this cold. Our adventure had started far below the mountain, some 200 kilometers (124 miles) away in the port of Cirebon. The first few hours were largely uneventful, as we cruised along a highway that sliced through glimmering paddy fields, before dropping us into the din of motorcycle traffic and a string of drab, featureless towns. 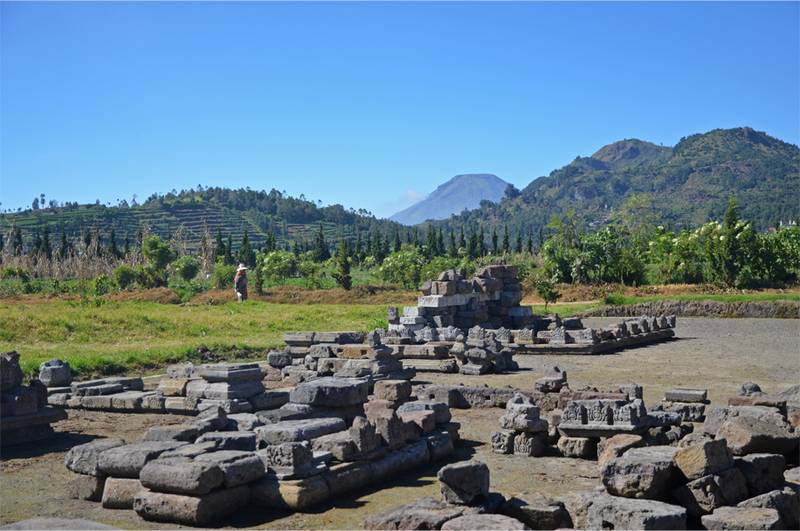 Turning off the busy Jalur Pantura, that crucial four-lane artery running along Java’s northern coast, we wound our way up into the hills, past the occasional house with spices drying on plastic sheets by the roadside. It was a drive that tested the limits of Bama’s fully-loaded car — and his resolve — on stretches where the road petered out into a blanket of roughly cut stones, with blades of grass poking out from the grooves between each block. We later emerged onto a narrow ribbon of tarmac, meandering below a steep, forested ridge. 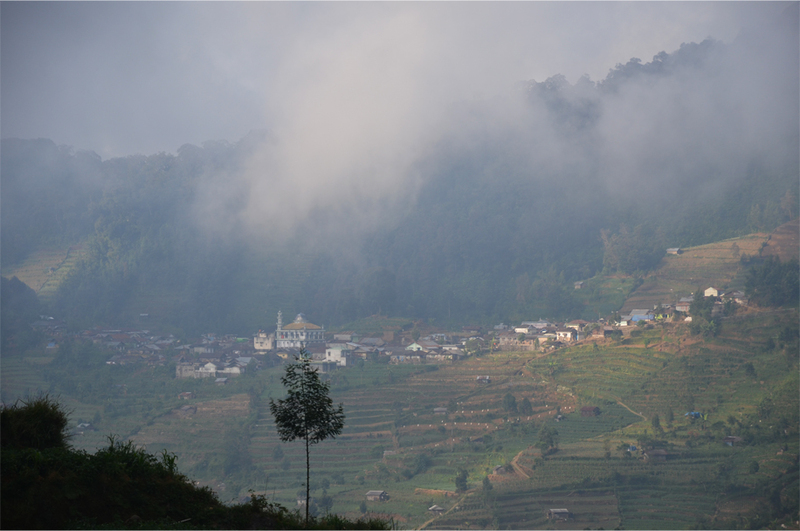 On the far side of the valley, terraced fields and villages were half-hidden in the clouds, and once we ventured even higher, the mist blotted out all but the closest features beyond our windshield. Eventually the road descended to a place where a strange combination of sun and vapour bathed the scenery in an all-consuming golden glow, as though we’d entered some mystical realm. 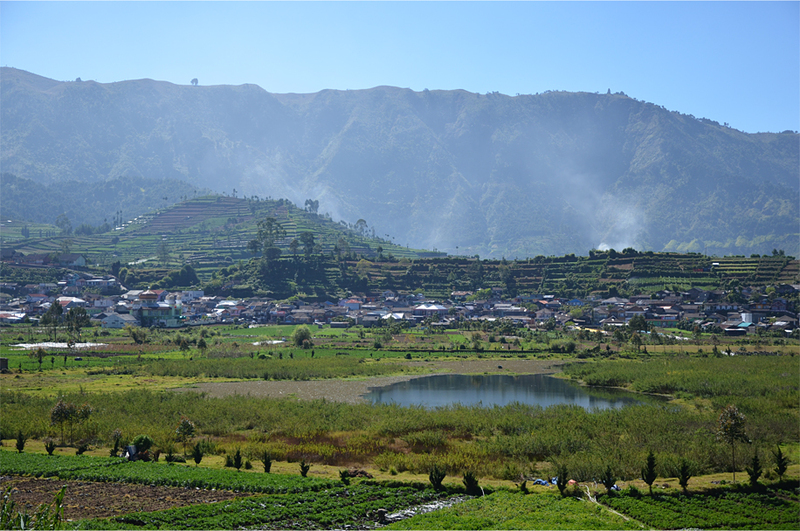 We saw ethereal silhouettes in the late afternoon light, plumes of billowing steam rising from an unknown source, and knew that we’d finally entered Dieng. 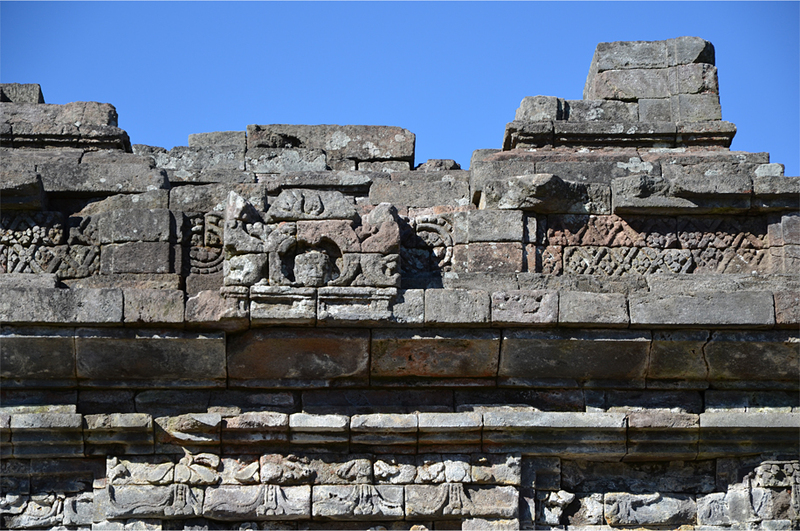 Candi Sembadra (back), Puntadewa and Srikandi, decorated with a relief of Vishnu. 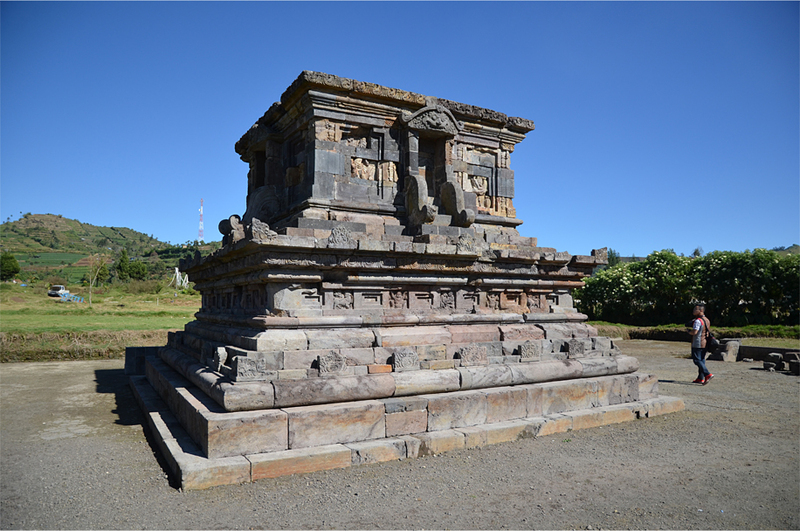 Javanese legends describe this area as Di Hyang, the “Abode of Gods”. It was, according to a traditional creation myth, the first place supreme god Bhatara Jagatprama made when Java was being formed, and the perch from which he created the rest of the island. 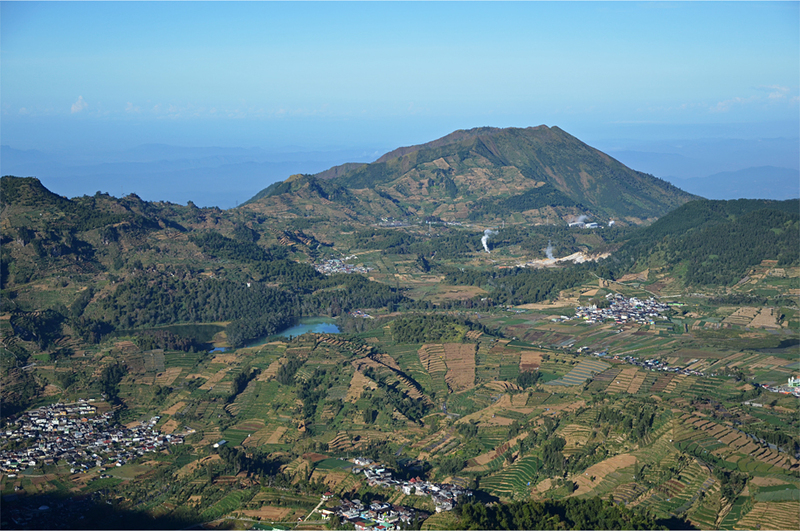 Although historic texts refer to Dieng as a mountain, the Dieng of today is synonymous with an ancient caldera at 2,000 metres (6,560 feet) above sea level. Here, the earth itself seems to breathe, as at Sikidang Crater, a perpetually boiling pool amid a threadbare landscape streaked yellow by sulphurous fumes. But the four monumental stairways and a great majority of archaeological sites have long since disappeared. Of the many temples that once dotted the plain, only eight remain standing. Each one is named after a Javanese wayang character drawn from the Hindu epic known as the Mahabharata, a fact that was not lost on Raffles. 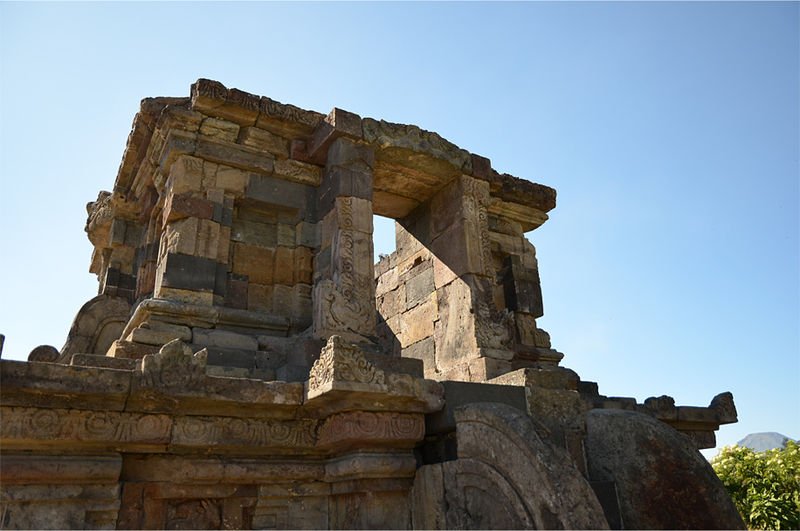 Early one morning, we embarked on a short drive to the well-preserved Arjuna complex, five noble shrines that stood more or less in the middle of the marshy plain. Two other temples, Gatotkaca and Setyaki, were within easy walking distance, though few of our fellow visitors seemed to have the desire or patience to explore either one. 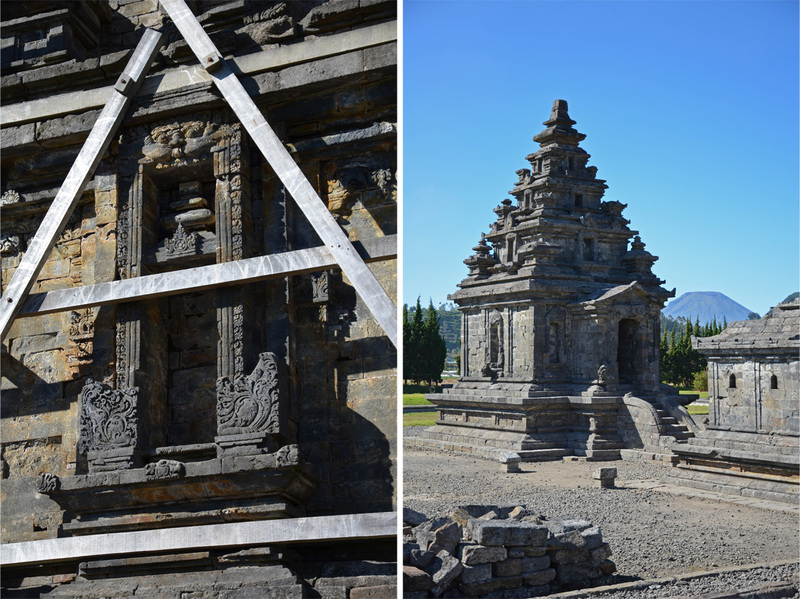 We spent at least an hour perusing the collection of Javanese artefacts at the nearby Kailasa Museum, which was dug into a hillside and aptly named after the snowcapped abode of Hindu god Shiva. 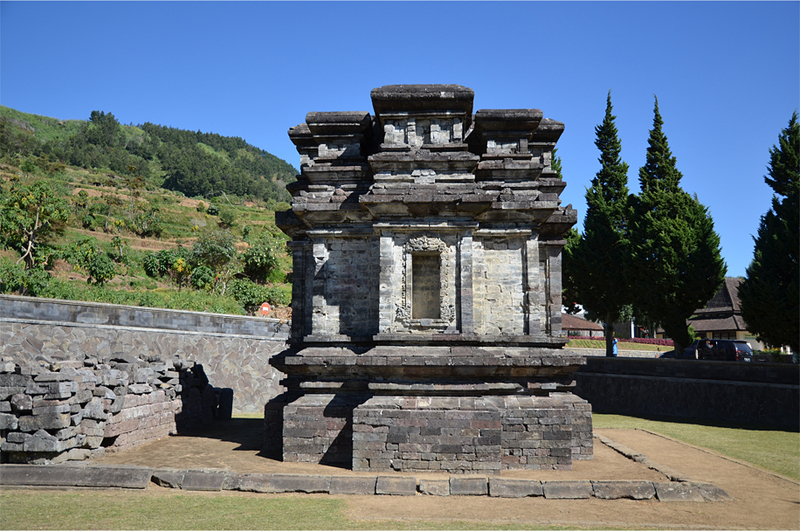 For Dieng’s temples represented the cosmic mountains of Hindu mythology, and its builders might well have been inspired by their surroundings. We were too, of course, and we’d planned a hike into the mountains. 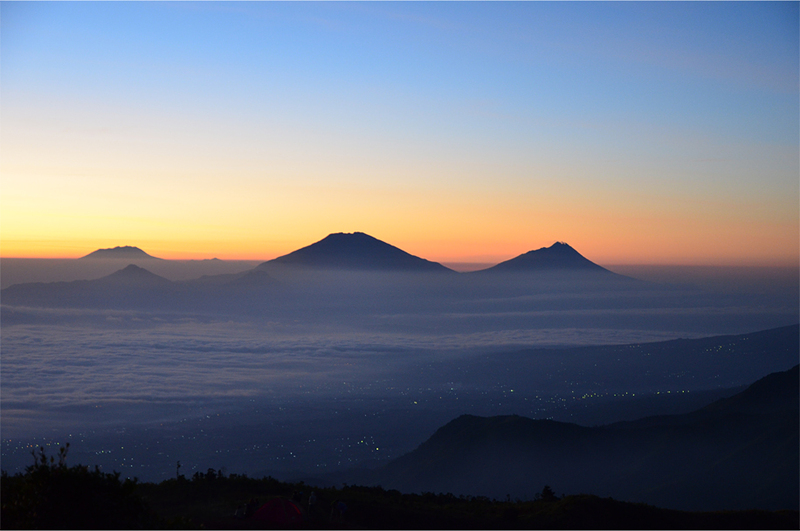 For what was a visit to Dieng without seeing the sunrise from Mt. Prahu? Badai was still keen on the physical challenge, even if the only footwear he had brought was a pair of sandals. At 2:00 a.m. that night, the four of us reached “Base Camp”, a darkened information booth on the village main street, where a thermometer read five degrees Celsius (41 Fahrenheit). Wrapped in our warmest clothing, we pressed on under a star-filled sky, the path ahead lit by the brightness of the full moon. It bathed the landscape in a soft, otherworldly glow, casting strange shadows on the fields of cabbage, tomatoes and onions, and on the scaly trees festooned with bunches of carica, a papaya-like fruit. Soon the trail was enclosed by thick stands of pine, and we picked our way over tangled roots and loose stones, through a forest now wet with morning dew. Yep, it was a great way to get out of the cities. Mt. Prahu is by far the coldest place I’ve ever been to in Indonesia, which I totally didn’t expect. 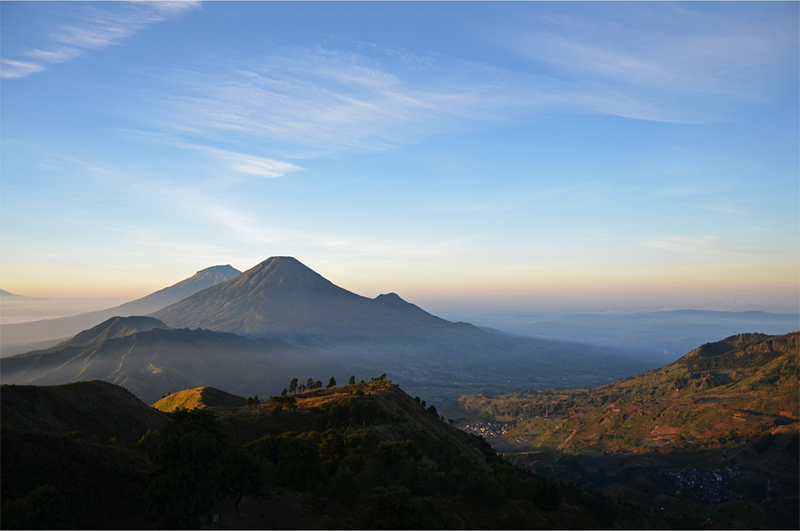 But I’m glad Badai suggested the hike for the majestic view of the volcanoes was definitely worth the lack of sleep. 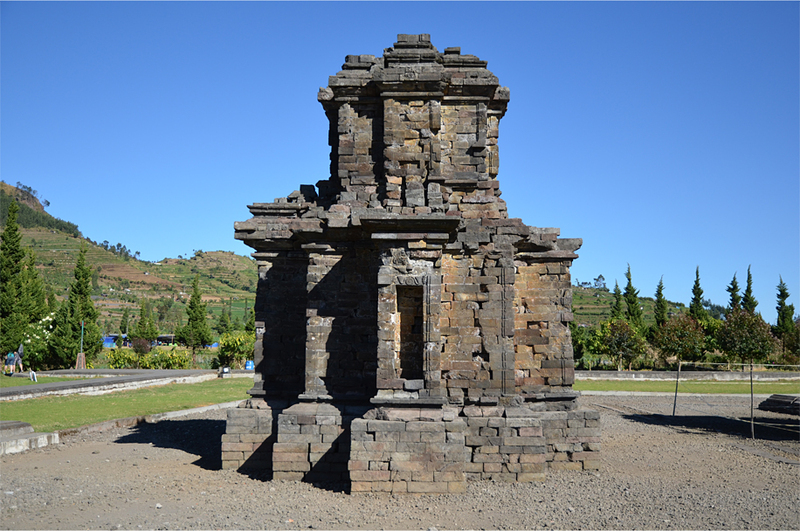 I wonder if there were no earthquakes, the ancient temples in Java would have been better preserved, and looked even more impressive today. 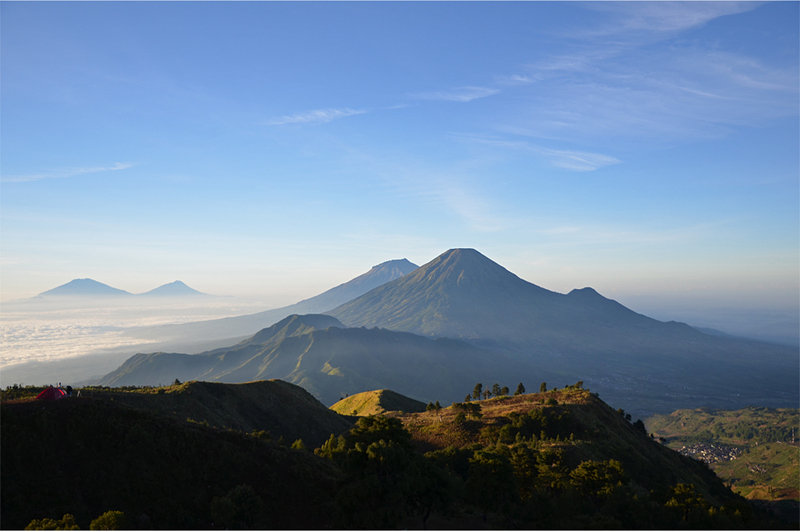 Same here – to be honest I couldn’t believe it was even colder than Rinjani! And to do it in the middle of Ramadan was pure madness. Reading Raffles’ accounts makes me wish someone invented a time machine… just imagine seeing exactly what he wrote about 200 years ago! Pictures are one thing, but I’d say it’s even better seeing it in person! You have some beautiful light in those photos. Sometimes we have to endure great suffering to see nature at her best. Sounds like it was well work the lack of sleep, effort and cold. 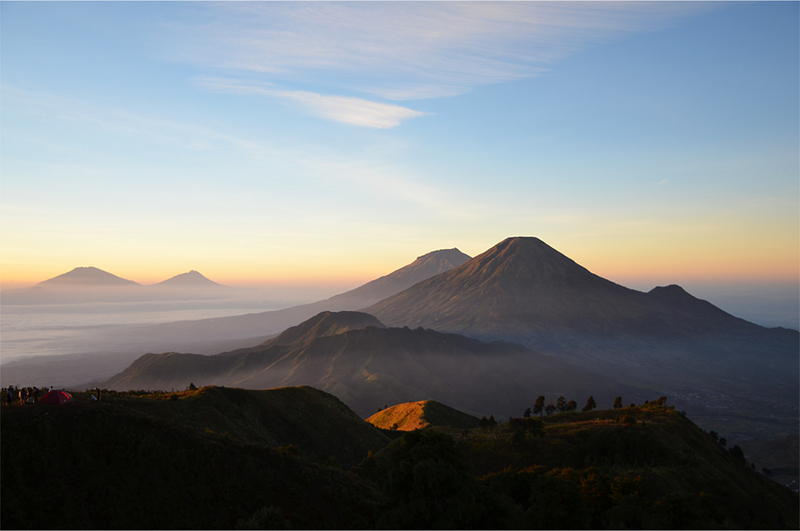 Have you been able to do much traveling around Indonesia since you moved to Jakarta? You’re right, Jeff – reading your comment makes me think of your stunning posts on the aurora in Alaska. Unfortunately I haven’t had much chance to travel in Indonesia except for a week-long break in early July. 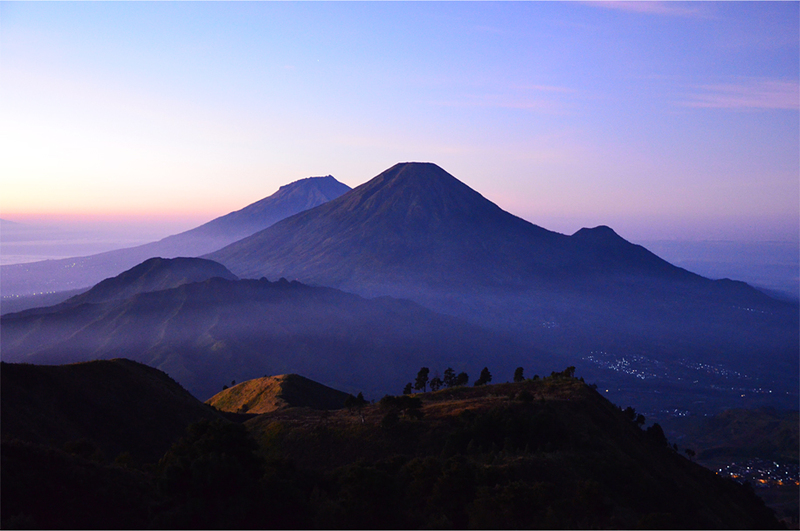 I was planning a trip to East Java sometime next month, but that has been postponed to next year because of work commitments. But on the plus side, I am sure just living in Jakarta is akin to traveling. Thanks Nicole! 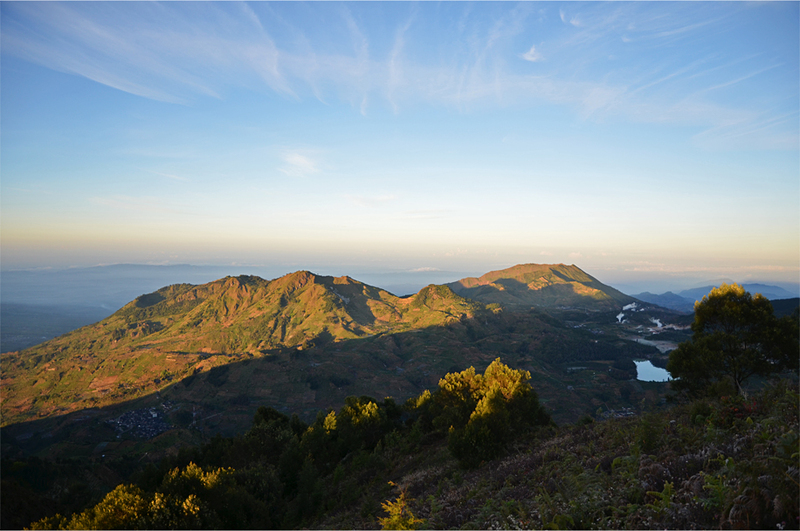 The sunrise hike is just the kind of experience you would enjoy!! Climbed Mount Prau is totally crazy experience for me. I must admit that I underestimated the weather at first. I thought it would be warmer than Pokhara in winter, but then I knew that I was wrong. I didn’t know what I was thinking, so I didn’t prepare any proper outfit to climb up. Thanks God, I brought that ‘sarung’ to protected myself a bit from that freezing winds. 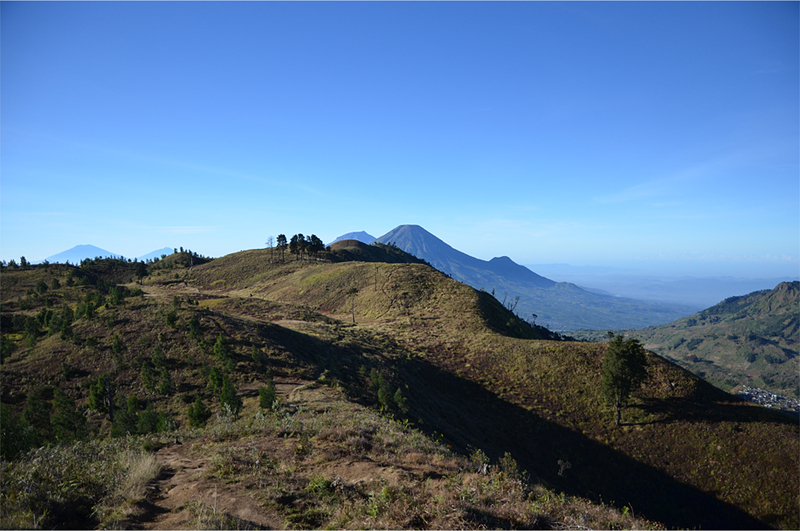 Whatever, for me, it was one of the best mountain climbing experience in Java. Seruuuu. I definitely regretted not bringing (or buying) any gloves – my hands were almost numb up there. At least you can say it was good training before your trek to Annapurna Base Camp! Hahahaha gak papa James, asal bukan manggil “mas” atau “pak” aja. 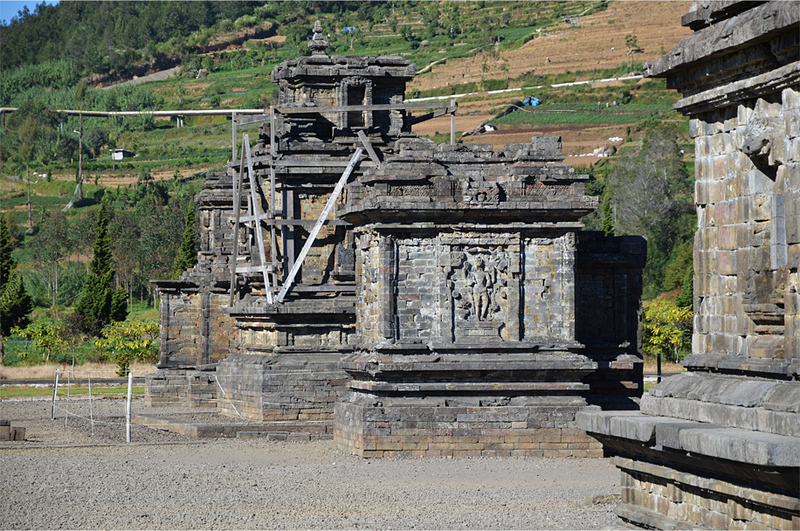 I have to admit I raced thought the history and photos of old structures in Dieng in order to get back to the kind of view you teased us with in the first photo. You know I most like to see the world on foot, especially from up high, so the descriptions and shots from your hike were like candy to me! The sunrise photos, in particular, were so stunning with all that mist around the peaks. Lovely! You would love this place, Lex! And I am sure that you would be much better prepared than I was in terms of both fitness and having the right clothes. I must have taken so many photos of the sunrise that day – the light and colours just kept changing! 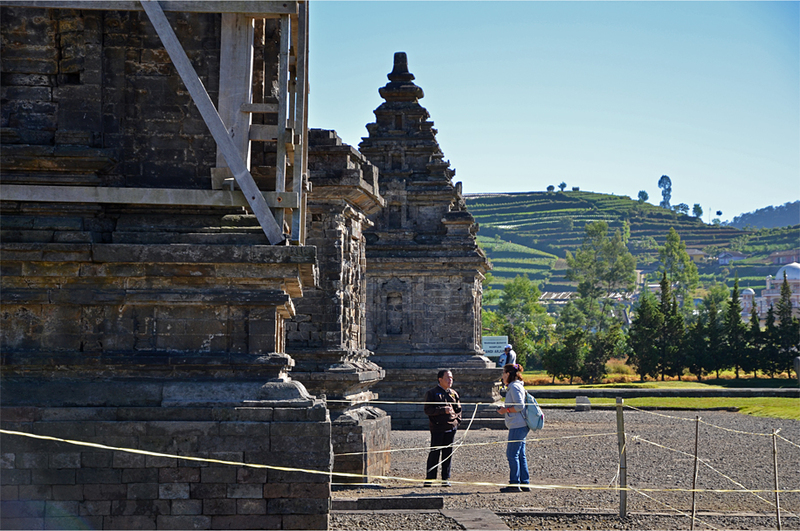 Beautiful photos, and a lovely description of the history of Dieng. I didn’t know about this place, and now it goes into my bucket list. Thanks. You’re welcome. 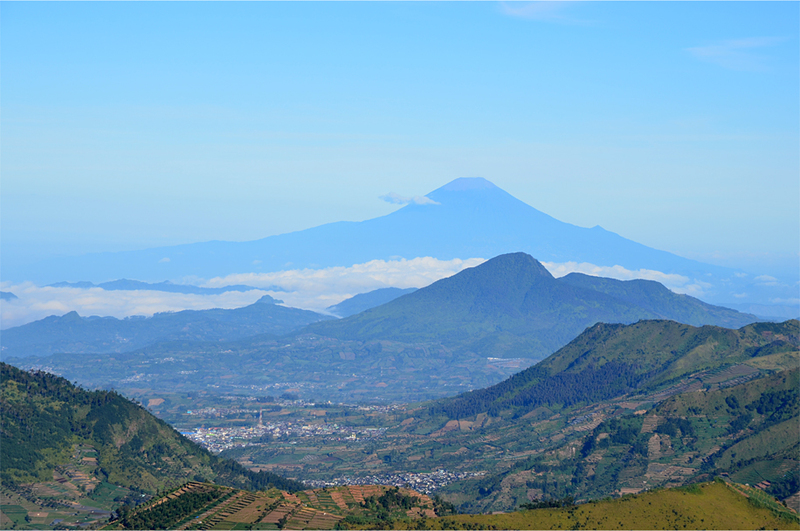 Dieng is barely known outside Indonesia, although we did meet a small number of intrepid European hikers elsewhere who had also climbed Mt. Prahu – and all of them mentioned the surprising cold! 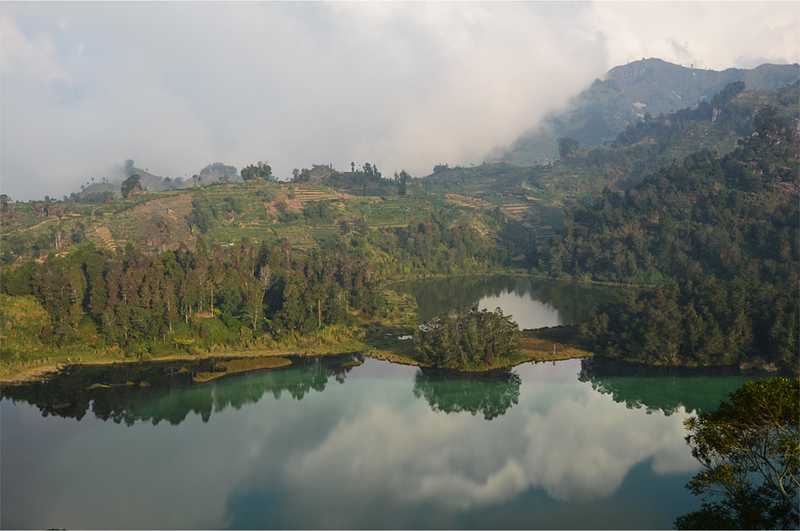 What an incredible set of photos to make this adventure of the highlands and history of Dieng come alive. A view from above is stunning at all times of the day, but to capture the lighting at the sunrise and the warmth of the sun coming up over the land…brilliant James. How I wish to hike those hills. Thanks so much, Randall. 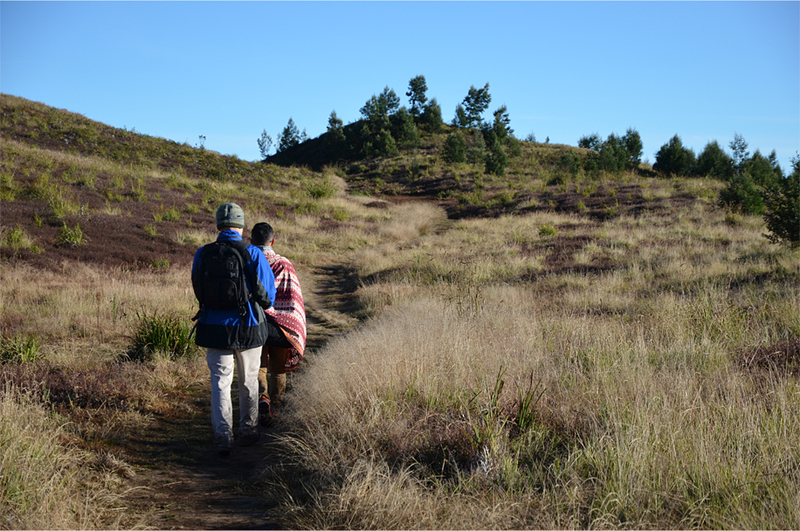 We couldn’t have chosen a better time or day to do the hike – it was more or less at the height of dry season. I think you’d also find plenty of photo subjects in the ancient temples and scenes of rural life. Such exquisite beauty James! And such wonderful photographs capturing it. Definitely worth the early morning and the cold I would say. When we set out from the village, the cool temperatures reminded me so much of an autumn night in Canada. Of course that was before we came across the freezing gusts on the mountaintop! Looks like you made the right decision to move to Java, eh. These are just lovely photos, as usual. I particularly like the one of Mt Slamet. 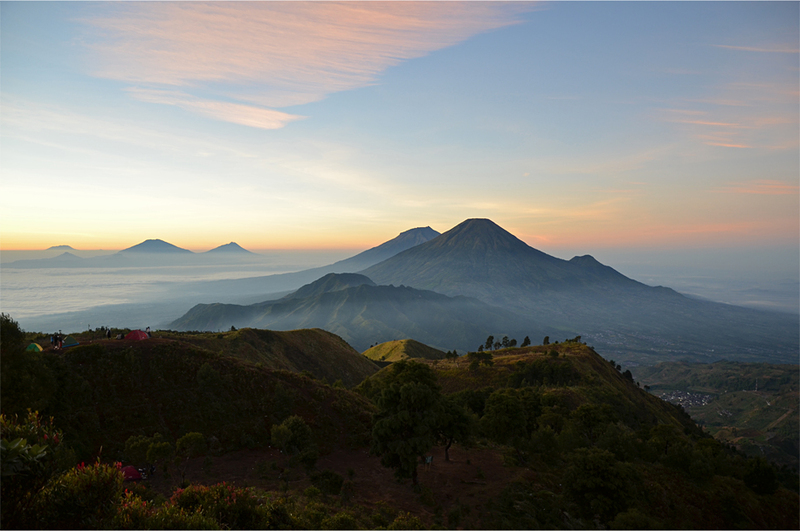 And daybreak at the heart of Java…lovely. And your writing…evocative and real, as usual also!! I used to like to rise early on trips and hike. Now, I don’t know…I’m not so eager to hike! You’re too kind, Badfish! Funny thing is, we did this hike at the start of our Spice Odyssey last year. It will be harder to get these kinds of shots now as dry season has somehow gone missing – there’s been so much rain these last couple of months. Ironically I haven’t had the chance to travel around Java (yet) since moving here, but Bama and I recently came back from a week in Japan! Japan…Business or pleasure? can’t wait to see that post!! You have a very good writing style. It keeps the narrative and spirit of traveling alive while also giving great information on the locations you visited. Enjoyable read! Thanks very much for the kind words! Sometimes being out in nature is the best way to come up with a good story.